Florida Good Standing Certificate | Online Corporate Docs, Inc. 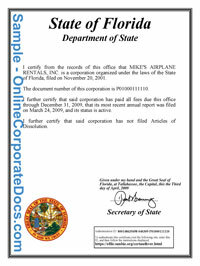 The Florida Certificate of Good Standing (Officially referred to as the Florida Certificate of Status) is an official document issued and bearing the seal of the Florida Department of State Division of Corporations that certifies that the legal entity is registered with the State of Florida and provides the status of the corporate entity. The original PDF certificate will have the printed seal as pictured to the left and a State issued authenticity code that can be confirmed at the Secretary of States official website. The Office of the Florida Department of State will issue a Certificate of Status to any domestic or foreign profit, nonprofit corporation or LLC/LLP that was duly registered or formed within the State of Florida and will state whether or not the entity is in compliance with the Department of State. What does a Florida Certificate of Status look like? - See example to left. There are a number ways to obtain a Florida Certificate of Status - Most file a business Copy/Certification Request form with the Dept of State - This form can either be mailed (7-10 days process time) directly to the Dept of State office in Tallahassee, FL - We can make the request for you and have the certificate to you next business. There is no expiration date on the certificate â€“ the validity of the certificate in terms of age will be determined by the organization that has requested it from you. For example your bank may request a Certificate of Good Standing that is less than 30 days old. Your entity must be legally Incorporated or registered as a Foreign Corporation with the Florida Dept of State and must be in compliance with all statutory reporting requirements mandated by the State - Specifically you must be current in your filing of Annual Statement of Information and payment of your corporate franchise tax.